126/159 David Mumpower CGI Lion King wannabe is neither dramatic more amusing. 2006 was a disastrous year for CGI family films. 133/200 Max Braden I think the photorealism sucked the approachability out of this one. A couple of years ago, buzz started developing around a CGI film from DreamWorks with a unique look and style. That film was called Madagascar, and it tells the story of four animal friends who are the primary attraction at the zoo in Central Park. When one of the four disappears one day, the other three escape to try to help him. They're all rounded up and put on a ship set for Africa, which wrecks off the island of Madagascar, where the group is stranded. They're forced to learn how to live like real animals of their species would. Now there's a film quietly set for release in 2006 by the Walt Disney Animation division. Since the company has essentially scuttled all traditional animation, it's to be a CGI-animated tale from Steve "Spaz" Williams, who is previously best known for his work on a series of hamster commercials for Blockbuster Video. The movie is called "The Wild." The Wild's plot centers around - wait for it - a teenage lion from the New York Zoo who is accidentally shipped to Africa and freed. His friends from the zoo, including an older, more mature lion, a giraffe, an anaconda and a squirrel, must put aside their differences and work together to help bring him back. 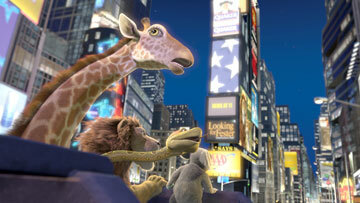 Okay, Madagascar is about a lion, a giraffe, a zebra and a hippo. And the voice actors include Ben Stiller, David Schwimmer, Jada Pinkett Smith and Chris Rock. The Wild has no zebra or hippo friend. It does have a second lion, an anaconda and a squirrel. Voice talent is provided by slightly lower-tier stars than the ones in Madagascar. So far, Kiefer Sutherland, Eddie Izzard and Joseph Siravo (The Sopranos) are onboard. Clearly these two projects are entirely different.